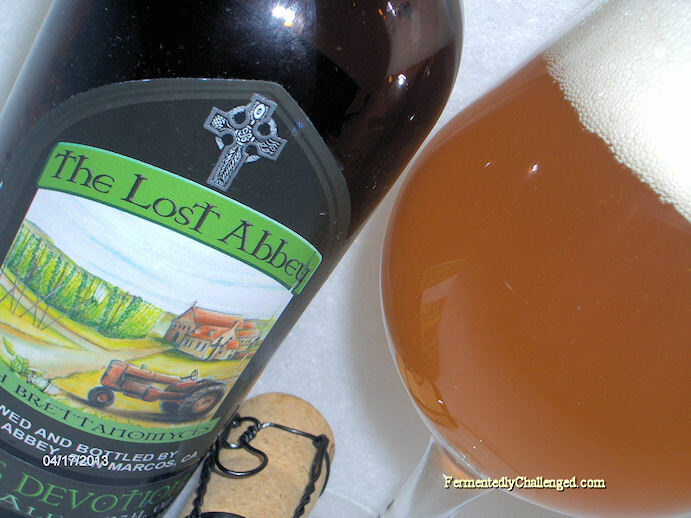 Here in Colorado, beers from The Lost Abbey of San Marcos, California are becoming more common to see on liquor store shelves. Colorado has been getting them now for over 5+ years. 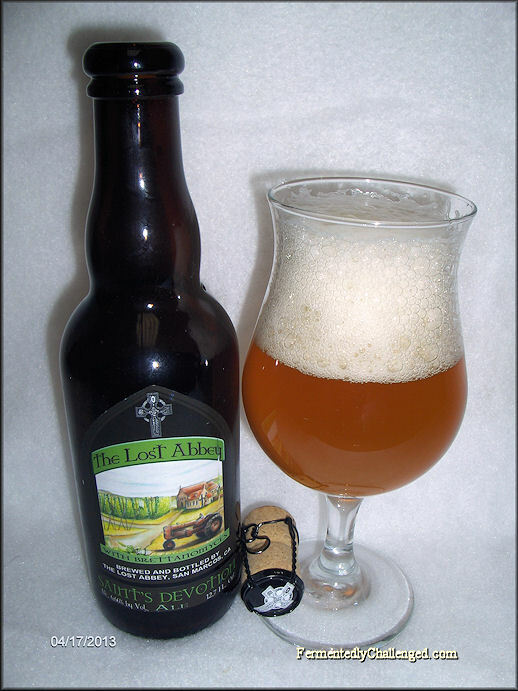 I spied a brew during a recent beer run that I hadn't come across before and being a sour beer fan, The Lost Abbey Saint's Devotion Ale caught my eye. This beer was brewed with Brettanomyces and is classified as a Sour / Wild Ale. This particular Saint's Devotion Ale came in a cork-n-cage 12.7 oz (375 ml) bottle. The bottle also had a batch number on it: 2013 Batch C - that was lightly stamped across the bottle. That stamp wiped away nearly as soon as my hand touched it, so I'm glad I got to see it before it was smudged. This beer is an offshoot of their year-round beer called Devotion Ale which is a Belgian style ale. This version, however, added something more to the Belgian yeast with Brettanomyces to give is a more wild and sour bite. Oddly enough, this is one their "Saintly sounding" beers, baring nearly the same label as Devotion Ale, but it weighs in at an evil 6.66% ABV, so be ready for a surprising twist. This beer was bottle conditioned as there was some noticeable sediment seen at the bottom of the bottle before opening. This beer was originally brews back in 2008 and then on a limited basis starting again in 2012. For this style of beer, I'd recommend either a snifter glass or a tulip glass for the best tasting experience. Appearance: Saint's Devotion Ale poured a light copper orange color that had a bit of haze, a touch of sediment and a big billowy white head that left big sized bubbles and a sticky lacing as the head receded. The 375ml bottle opened with a huge loud "pop" when the cork finally came loose. The beer had plenty of carbonation. Pour this one slowly and into a clean glass as the head will build up quite quickly. Aroma: Ah now here's the Brett I've known and have come to love. The aroma was unmistakably Brettanomyces, wild, funky, slightly fruity, and with hint of sourness in the air. I detected some sweeter tones in the mix, but the Brett seemed to want to take center stage when inhaled deep. The aroma reminded me of a Saison I'd had recently, only more wild. The beer reminded me of aged leather. All that was missing was a good oak barrel scent and it would have been perfect. Taste: On a sour scale of 1 (low) to 10 (high), this beer was around a 6.5. Not overly sour, but with enough funk that gave notice. The beer had a slightly earthy tart flavor with hints of Belgian malts and yeast in the background. This beer had a hefty breadiness, with a touch of dried citrusy fruits, a pinch of pepper and mild spices. The beer drank smoothly and finished on the dry side. I sensed a bit of lemongrass too. While burping after a big sip, the flavors really came through (yes burping does occasionally bring out more in a beer). Be sure to burp through your nose for full effect! I kid you not. Overall: As a sour beer lover, I immediately took to this beer. I love funky brews with Brett and The Lost Abbey's Saint's Devotion Ale did not disappoint. It was light, crisp, dry and funky with a hint of tartness. As I said before, if they had barrel aged this in oak it would have been even better. I would definitely buy this beer again. It won't overpower your senses, but give you a lot of wild flavors to test your palate.